I hadn't previously heard of Crest, despite it having been in early access since April. 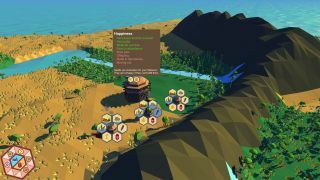 The release of a new trailer has changed that, and could well be of interest to those who like bossing around primitive peoples. "The player is an unseen force, interacting with followers through expressive commandments, depicted by symbols. Your instructions will be interpreted differently by each city and hut, dependent on both the inhabitants’ current states and the experiences of their ancestors." It's possible, then, for humans to misinterpret your commands. Just like in real religions, I guess. Crest has just received an update that adds lions, midwives and cannibals. And also Steam Cloud support. For more, head over to the Steam page.